The Fevour Cosmetics Rewards Program is designed to help you get the most out of your membership. 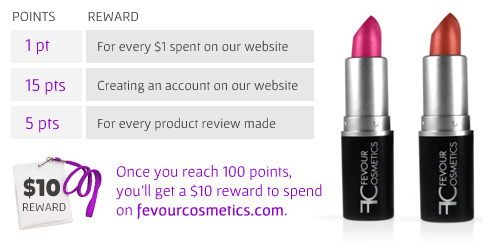 We reward you for doing the things you already do: shopping on fevourcosmetics.com and giving feedback on products. Why not get rewarded by earning points for discounts on Fevour products?! It’s easy to rack up points. You can always check your Fevour account page for your current points balance. Please note a minimum purchase of $20 after reward points is required when using reward points. Reward cannot be used in combination with any other certificates, coupons or discounts.